Members who wish to do research meet any Tuesday (1.30 – 4.00 p.m.) at Sutton Library, coming as often as they wish to pursue their research topic, with help from experienced members of the Group and library staff. All members receive regular newsletters with details of our occasional field meetings and public lectures, and a free copy of our Proceedings whenever it is published. For further details, see Join Us. 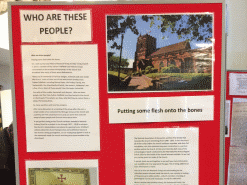 An Exhibition by Sutton Coldfield Local History Research Group was one of the attractions marking the start on Tuesday, 19th February 2019, of more frequent Open Days at Holy Trinity Parish Church. This was the brainchild of Marian Baxter, our Vice Chairman, who suggested to Revd John Routh that it would be a worthwhile exercise to record details of the lives of the people whose memorials appear in the church. 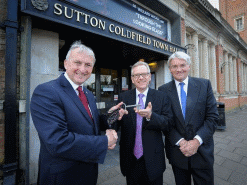 A MULTI-MILLION-pound plan to revamp a landmark Sutton Coldﬁeld building was revealed this week, as the keys were ofﬁcially handed over from the city council to a trust to mark a new era for the venue.